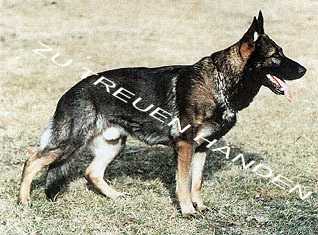 Endi is seen here at 8 years of age. 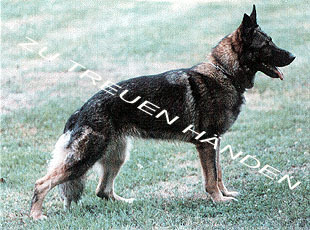 Though she did not have the nerves I demand for a breeding dog she proved to a valuable asset to our cattle operation. Endi is my background dog seen doing her favorite job: working "her" cattle. In March 2000, Endi was diagnosed with Perianal Fistulas (PF). PF is thought to be an autoimmune disease. 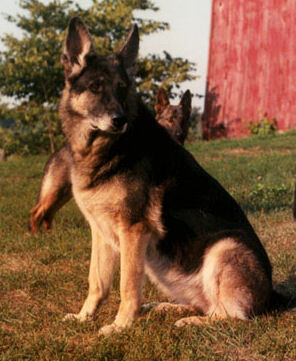 With treatment she went into remission for 3 years, but when it returned with a vengeance I finally had to put my old girl to sleep. 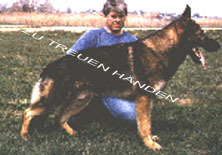 Sire: 'V' Rolf von den Eschbacher Klippen SchH3 FH KKL1a son of Grief z. Lahntal with lines back to VA Marko v. Cellerland, VA Quanto Wienerau, VA Frei v.d. Gugge, Fello Lierberg. 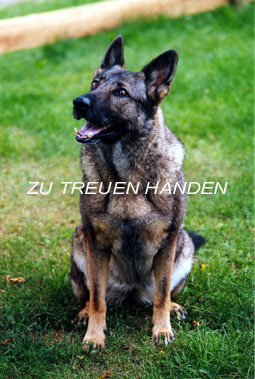 Dam: Sabrina v. Lerchental SchH1 OFA good by Spitzen "V" Rocco v. Busecker Schloß with lines back to VA Bernd v. Lierberg, VA Alf vom Convent, Jupp v.d Murrenhütte.